You are welcome to make your own way out to the start line, however, you will need to make arrangements to pick your car up after the event. We will operate a free shuttle bus from town to the start line at Daltons Bridge for the 6.5km fun run/walk, 12.5km trail run and half marathon trail run only. Entrants in the 6.5km junior cycle event will need to be transported out to the start line. You are responsible for making sure you leave enough time to pick up your bib, walk to the bus loop and to get out to the start. Please take note of NEW LOCATION and NEW TIMES. If you are going to drive out yourself, see the directions for the 6.5km junior cycle, below. LOCATION: The pick up point is the Cohuna Secondary College bus loop, 6415 Murray Valley Highway, Cohuna. We suggest leaving your car in the main street precinct and walking to the school (it’s only 500m). TIMES: The first bus leaves at 7.15am and is for entrants in the half marathon only. This is the only bus for the half marathon start – if you miss this bus you must make your own way out to the start line. All other buses are for the 12.5km and 6.5km events, with the last bus leaving shortly after 8am. Our buses are a FREE service. A massive thank you to Ron Stanton and Murray Johnson who are providing the buses, and to the drivers who are providing their time completely FREE for the day. Be sure to give them a big smile and thank you as you board the bus. Entrants in the 6.5km junior cycle will need to be transported out to the start line at Daltons Bridge. Please ensure you take everything your rider needs with you and be there in plenty of time. It can be congested at the drop off point so be alert and allow extra time. 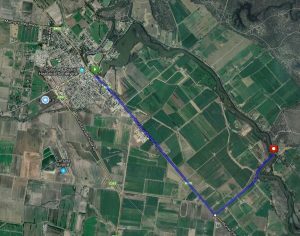 From town, drive out along the Murray Valley Highway and turn left onto Daltons Road (about 4.5km from the town roundabout). Drive along Daltons Road until you’re almost at the end (you will see part of the road near the bridge is blocked). Take note; Daltons Road is a narrow road and you will also have school buses using the same route. Island Road will be closed so you will not be able to drive out that way. Route out to start line at Daltons Bridge.